Nickel ions can be released by some Nickel-containing materials. 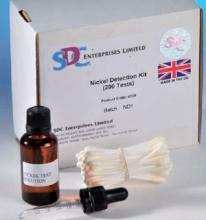 Prolonged direct contact with Nickel ions can cause skin sensitization and lead to allergic contact dermatitis. This has been designed as a quick in-house swab test to check for the Nickel ions from components that will come into direct and prolonged contact with skin.